Some of the best land resources in California, both public and private, are considered ‘grazing lands’ – some estimates put it at 80% of the state’s area. California is right around one hundred million (100,000,000) acres. Where my family lives, in the southern Sierra Nevada, the grazing lands in the foothills also contain the prime oak woodlands, significant plant and animal species diversity and the famous, fabulous rivers that course down from the high country. There are about two million acres like this in the southern Sierra’s middle elevation watersheds. These lands are overwhelmingly privately-owned, and thus vulnerable- actually, threatened, by sale and subdivision into residential use. Frequently, County General Plans encourage development in the foothills, rather than in already-existing towns and cities. Apparently, it’s easier for developers to just bulldoze nature than to work through the complexities of city Planning Departments and it’s lucrative for landowners to sell off. Ecosystems are varied, complex, interwoven, resilient entities. I know, because I’ve worked as a wildlife biologist and researcher for all of my adult life. As a private property owner, I want my land, my ecosystem, to mimic nature so that when, inevitably, change occurs, my business and my land survive. That means that the more varied and complex my business, the less vulnerable it is. How do I achieve that? For starters, by having varied and multiple revenue streams. 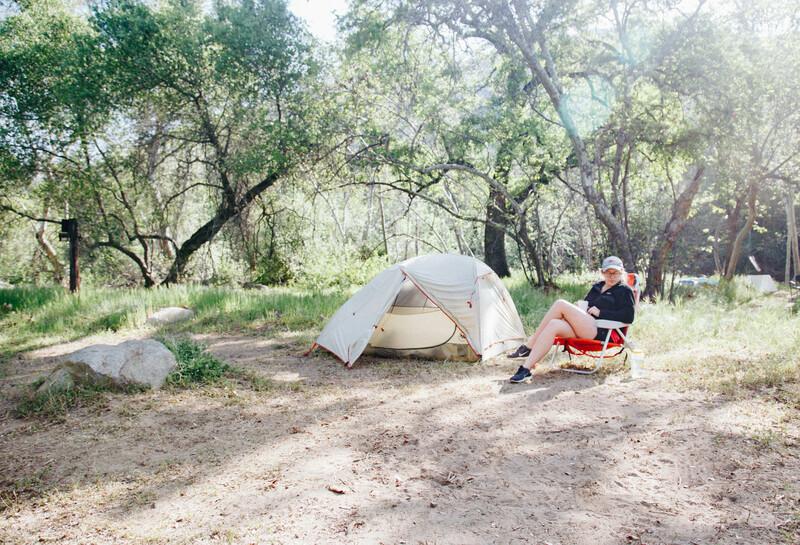 Hipcamp provides that opportunity for willing landowners to form a new source of income with a proven partner that is equally enamored of land, open space, nature and sustainability. And, most Hipcampers, as they are named, are young and are the influencers of the future. Our land has acted as host for decades, before we purchased it and before Hipcamp was born! But, the guests weren’t people, they were livestock—there long before we purchased River Ridge’s 722 acres about twenty years ago. We voluntarily placed a Conservation Easement on our land, so that it could never be subdivided. A local land trust holds and monitors the easement we wrote. We gave up the subdivision rights, but we kept all the rights to agricultural, recreational and educational uses. Cattle grazing was the only source of revenue that came with the property and it has kept us going as we struggled to make financial ends meet. It has also been one of the challenges- how to allow cattle to roam without reducing sustainability and, much harder, how to repair past damage while livestock are present. Without boring you about the day-to-day, we have found that grazing livestock is financially pretty much a wash for us. We don’t own or run the grass-fed, grass-finished beef operation, so we don’t make the profits, We get an annual lease fee. And we get to fix all the wrecks! It turns out, we’re not the only ones in this dilemma. A doctoral dissertation from UC Berkeley by Luke McCaulay (1,2) showed that the majority of ranchers in California either lost money or broke even. As McCauley’s work revealed, they mostly did it for their love of the land, the lifestyle, and to keep it around for their descendants. Hmm, so money’s not the primary motive? Profit, in a way, is not the goal. But, what if one could both keep and improve land and make more money than grazing? Hmm. We’re still grazing, but we’ve just given our grazier a year’s notice! Beginning in late Summer 2019, cattle will leave the ranch. And then the fun begins. Or, the pain. The common wisdom, not born out by much scientific research, is that grazing is necessary to prevent a host of negative consequences. For example, the spread of ‘exotic’ introduced plants. Remove cows and the thistles and nettles will take over, goes the hypothesis. Another example is the buildup of ‘thatch’- plant growth that, when unharvested by cattle, will dry, die, fall over and be overlain by the next year’s growth. Do that enough and you’ll have an impenetrable mass of vegetation that will impede wildlife movement, sequester less carbon, reduce water penetration, etc. Is that true? 18 months before the withdrawal of cattle grazing and then follow it for years without the cattle, to collect the ‘After’. Another is the ability to improve the outdoor experience for lodgers. Gates all open, no cows and bulls to dodge, no cow pies to avoid, less flies. Another prediction is an increase in wildlife, such as deer. Deer have been documented to avoid feeding and activity when cattle are grazing. More activity, more feeding, more reproduction; will our deer population increase? Will the rest of the wildlife? Will we see a reduction in exotic, pest birds such as European Starling and English House Sparrow, species that compete with our native birds for nesting and food?